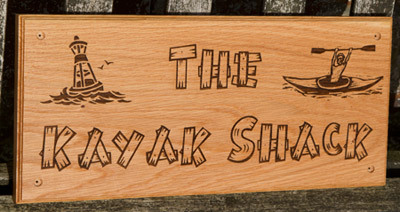 Our elegant range of wooden house signs is ideal for small wooden signs or when fine detail is required. We can use delicate fonts and borders along with images with finer detail and even line drawings. 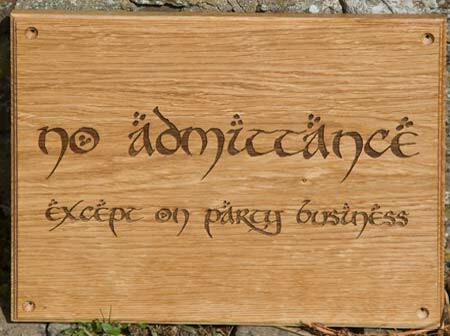 We can also engrave the lettering as small as 10mm so these signs are ideal if several words are needed. Choose from any of the fonts in our list. Up to 50 characters are included in the price. Extra characters £3.00 per 50. These signs have a big advantage over the sand blast signs in that we can use any of the single colour images, line drawings or decorative borders. An image or decorative border can be included. Click here to see the huge range of images and borders. Another option is to add a full colour porcelain photo. 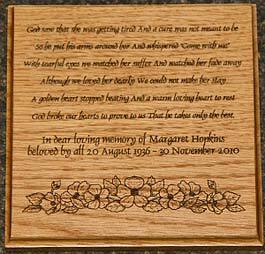 The 100mm and 150mm high signs can be made in Oak, Sapele, Cherry or Iroko. Oak is a very beautiful timber and exceptionally durable but does need to be maintained. Cherry needs to be very well maintained. We treat our timber as standard with a long life satin varnish but can also use Devon Oil or Osmo Oil. Iroko has a high oil content and can be left untreated. Sapele is similar to mahogany and even harder than oak. Made in the UK. 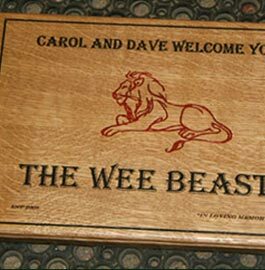 Our team at The Sign Maker looks forward to helping you with your wooden plaque or sign.